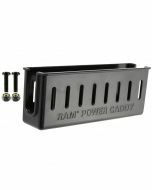 The RAM Tough-Tray is spring loaded expandable tray that can accommodate 10 to 16 inch wide laptops. The tray includes four (4) side clamping arm with rubber grip feature. These arms can be moved both vertically and horizontally. This allows for a custom fit for varying thicknesses of laptops and the freedom of not blocking ports or drives. Hole patterns on perimeter of tray facilitate the mounting of additional RAM systems to support GPS, smartphones or other electronics. At right angles to the base of two legs are feet with mounting holes. Simply place the holes into the passenger seat mounting bolts and adjust the mount to the required height with the rigid aluminum rod legs. The third leg on the RAM POD III should also be adjusted to help support the mount. The rigid aluminum rod arms will hold everything you need safely and securely.